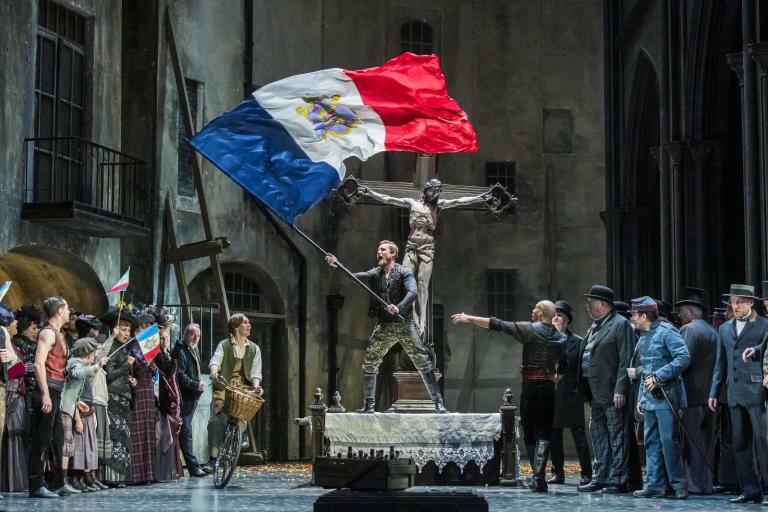 This season, the Liceu has included in its programming the world premiere of an opera commissioned by the house, something that has not occurred here for quite a while. The opera is the work of Catalan composer Benet Casablancas, with a libretto by Rafael Argullol. Curiously, the libretto of the opera was initially written in Spanish and later translated into Italian, which is how it has now been staged. It is the first opera by the Catalan composer, and I have the impression that his work will have left opera critics more satisfied than the opera lovers in the audience. It is not an easy work musically, although I found it more pleasing than several other contemporary operas that I have had occasion to see (and on some occasions to suffer through) in the past. I was impressed by the orchestration which is quite rich. The plot centers on Lea, who has been raped by what is called in the program notes a superior being, although the libretto speaks with more clarity of God. She is given the nickname of God’s prostitute, warned against revealing what happened and condemned to wander through space and time accompanied by two fierce guardians, Millebocche and Milleocchi, who constantly remind her to keep the secret. In her wanderings she meets the Three Ladies of the Frontier who guard the end of the world; there she comes across Ram, a sleepwalker, who is also restricted in his movements for having made love with Death. The second act takes place in a kind of asylum run by Dr Schicksal, the former owner of a circus, who tells the story of Lea and Ram. Finally, Lea and Ram are happily joined in Act III. The production is by Carme Portaceli, and its simplicity suits the opera. 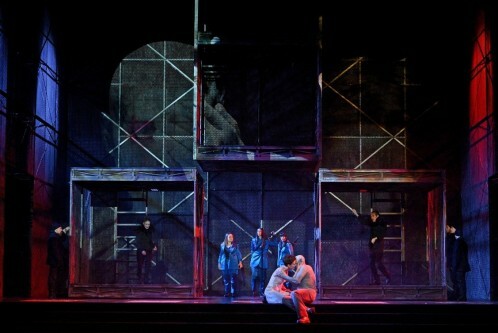 Metallic elements with mobile hanging cells fill the stage and are appealing to the eye. The costumes suit the story, and the lighting is good. The soloists were well directed, and I would point out the fine work of the Guardians and the Ladies of the Frontier. It is not easy to judge the musical direction in an opera that is absolutely unknown to me, and even more so if it is a contemporary work. However, Josep Pons’s reading left a favorable impression: he conducted with great attention and a lot of care, in terms of both the pit and the stage. The Liceu orchestra and chorus gave solid performances. The role of Lea was sung by mezzo soprano Allison Cook, who has an attractive voice and acted with her usual intensity. Baritone José Antonio López in the part of Ram displayed a sonorous voice, and countertenor Xavier Sábata as Dr. Schicksal was an easy presence on stage. The two guardians, played by soprano Sonia de Munck (Millebocche) and bass Felipe Bou (Milleocchi), were impressive, as were the Ladies of the Frontier: Sara Blanch, Anaïs Masllorens and Marta Infante. Finally, the artists in the asylum, David Alegret, Antonio Lozano and Juan Noval-Moro, were very good. Attendance at the Liceu was only around 60% of capacity. The cast was well received at the final bows, although there was no great enthusiasm.